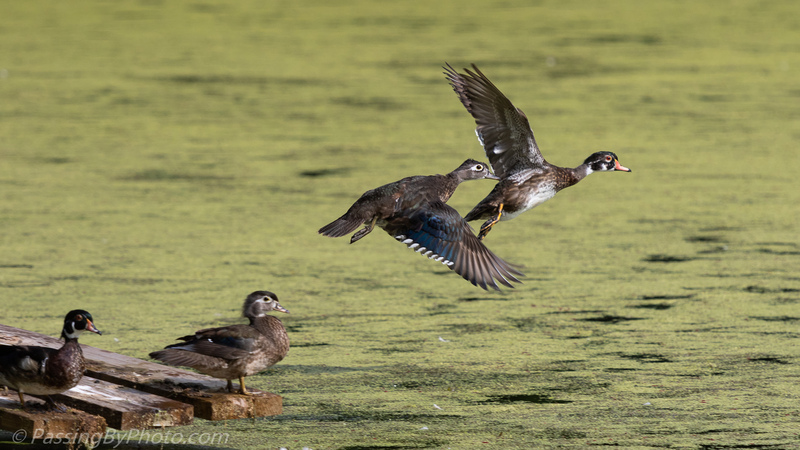 These ducklings and their Wood Duck mom were exploring the middle of the pond, back and forth. 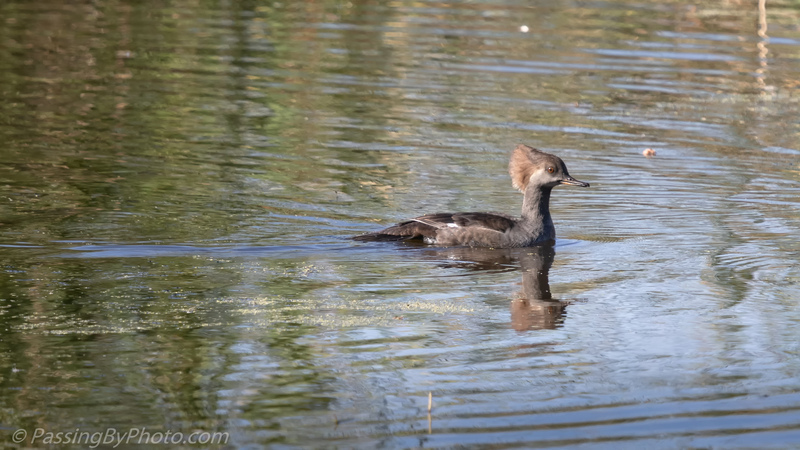 Mom was working hard keeping track of her charges. 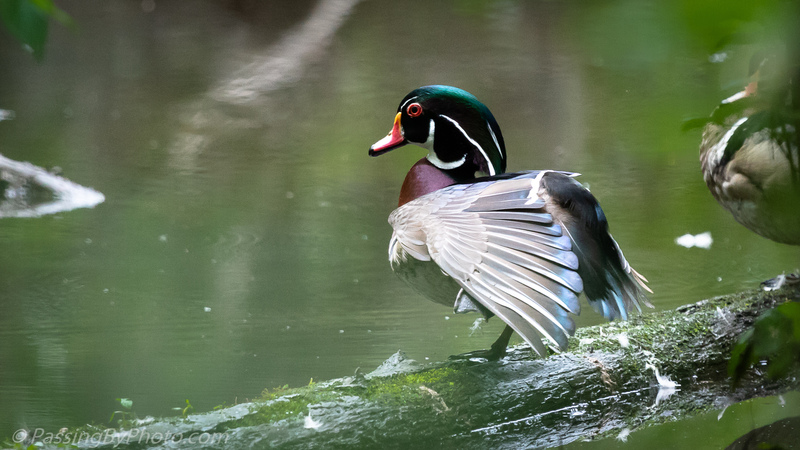 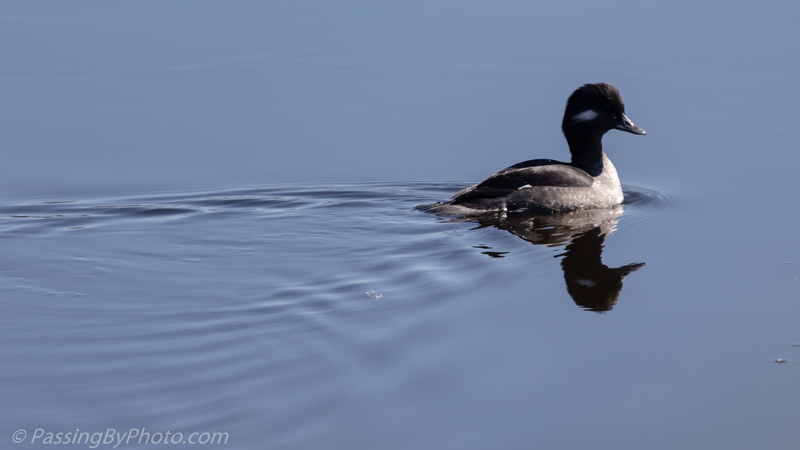 A male Wood Duck was nearby but didn’t appear to be helping with the minute to minute supervision. 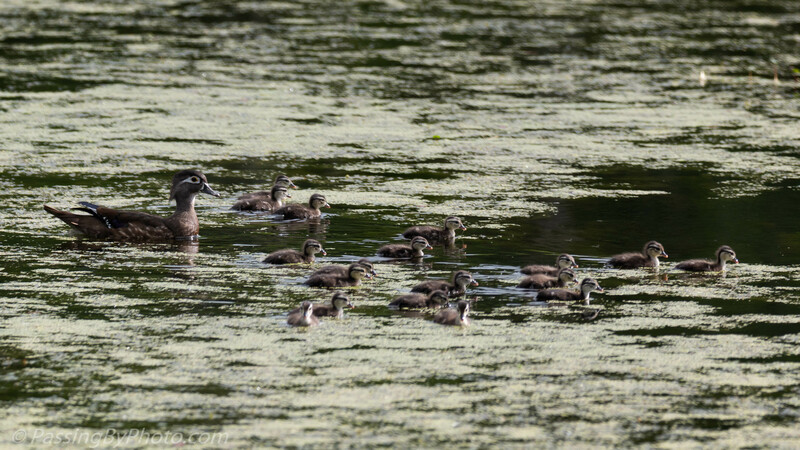 When they finally spread out a bit I counted 18 ducklings! 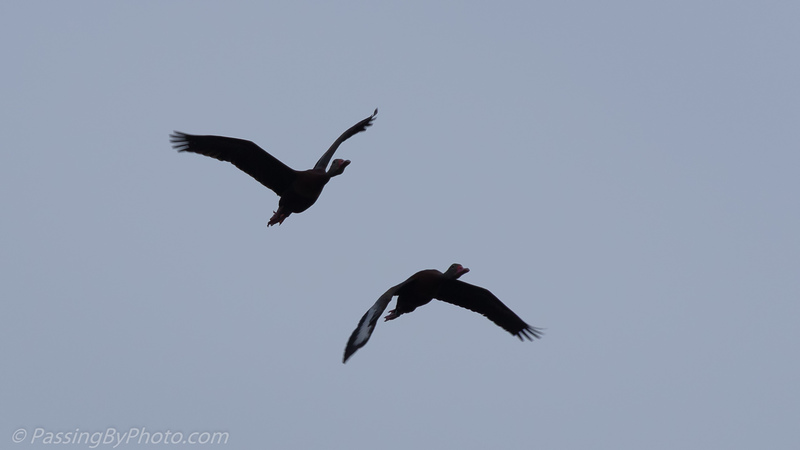 This is the first Whistling Duck I have seen in South Carolina. 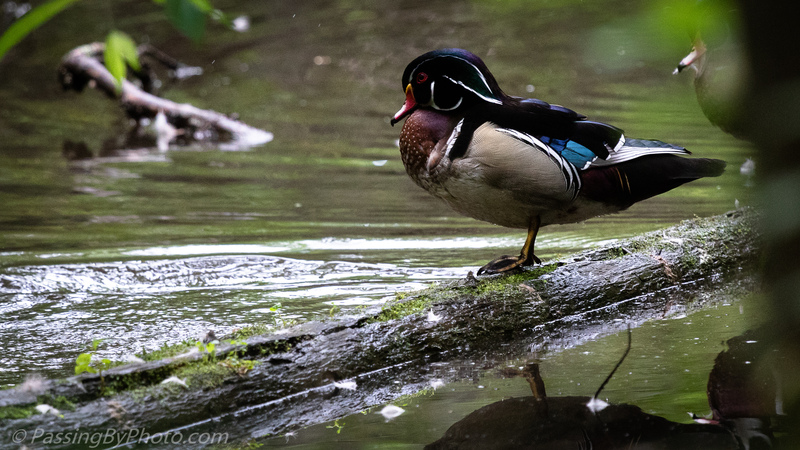 He was perched high in a tree over a pond and I couldn’t even tell what it was until I zoomed in on the image in my camera. 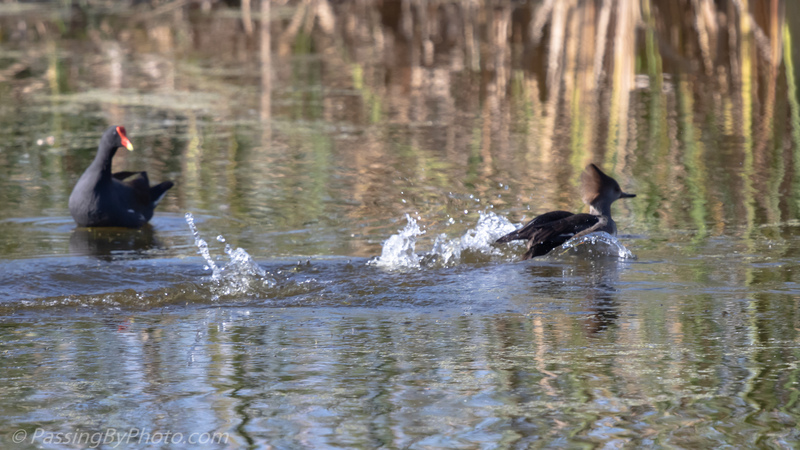 The duck periodically threw his head back and made a very un-duck like sounding call. 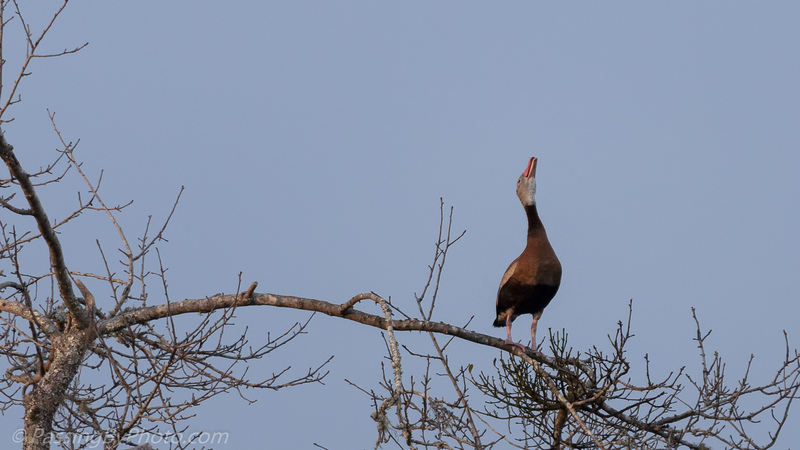 A pair of Black-bellied Whistling Ducks flew by, but didn’t slow down to listen to the one in the tree and he didn’t make any effort to join them. 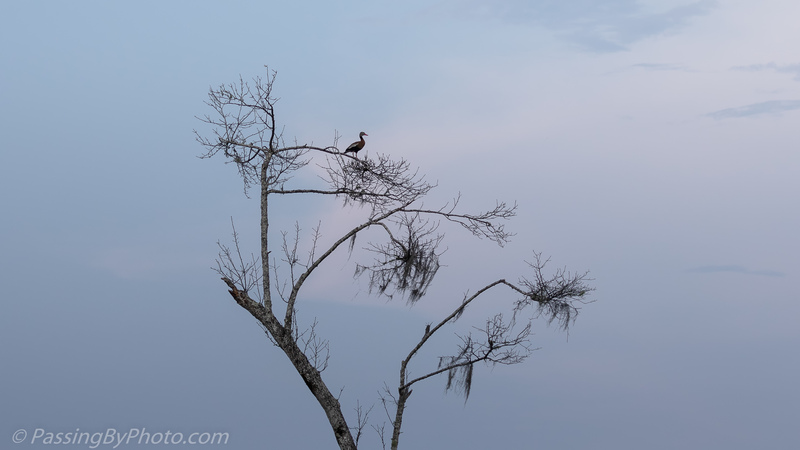 There was still about a half hour until sunset, but the sun, which was behind me, was disappearing into a cloud bank, taking the light and any possibility of a colorful sunset with it. 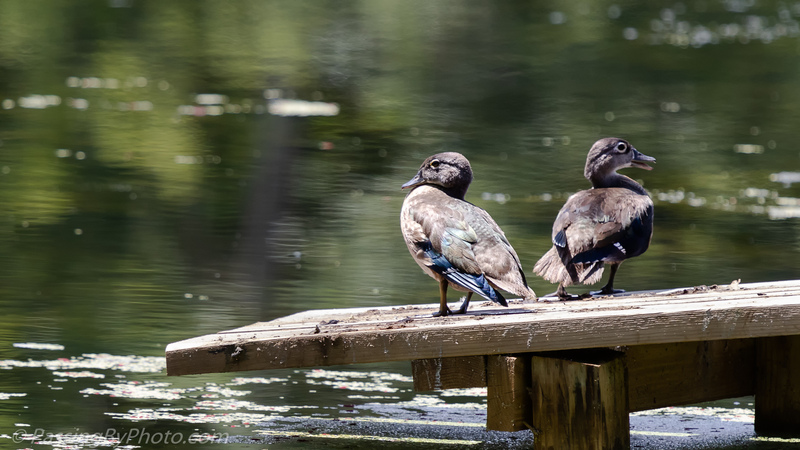 As juvenile Wood Ducks grow it becomes harder to tell them from the adult females. 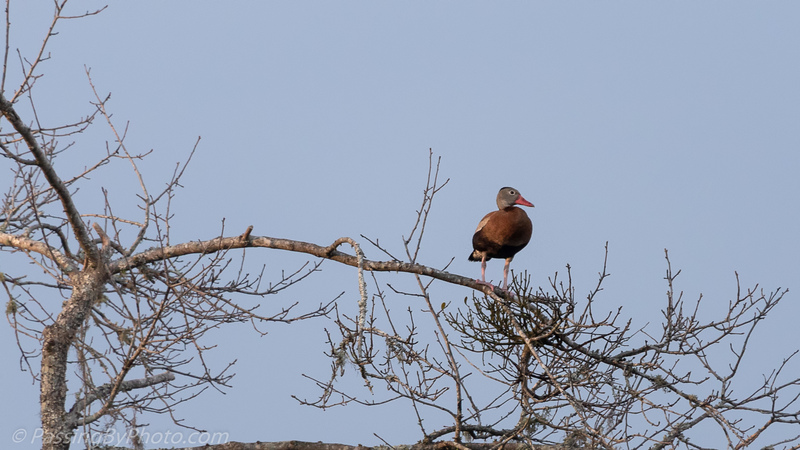 These two were hanging out getting some sun on a recent afternoon, showing some of their newly developed colors. 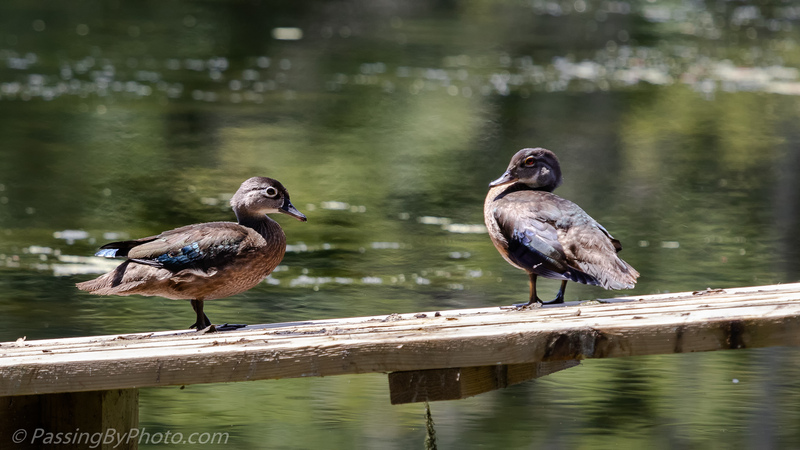 Not content to just sit, one of them took a walk to the other end of the ramp to see what a third duck was up to. 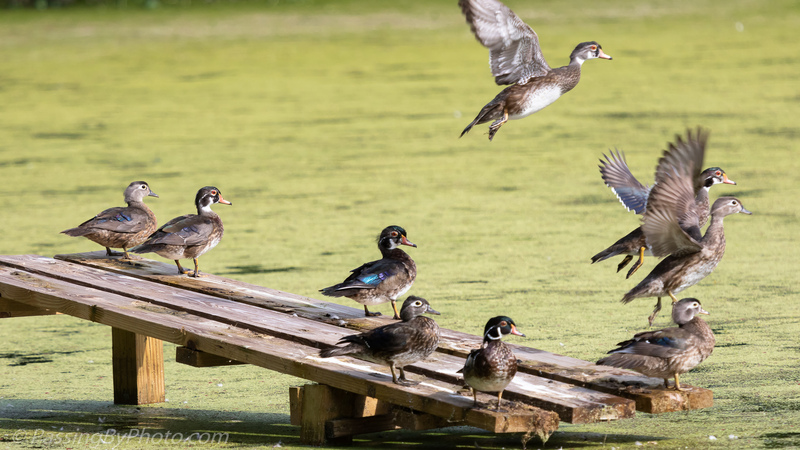 The alligator ramp they are on is not far from shore and any ducks that are on it usually head for the middle of the pond after a few photographs by passers by. 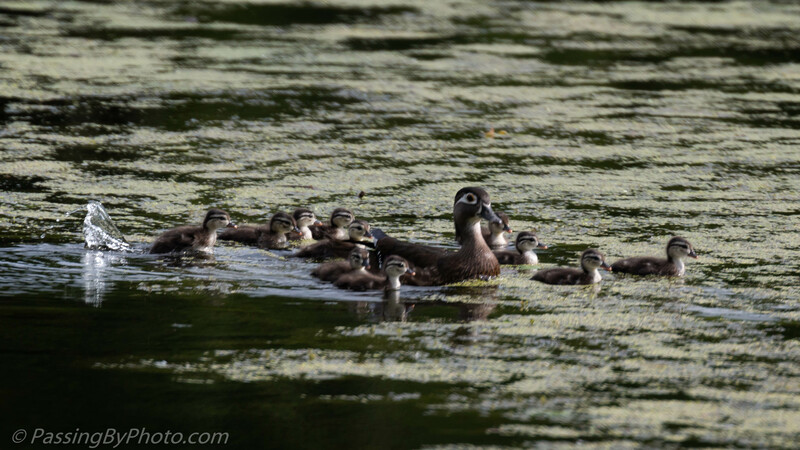 A mother Wood Duck usually stays with her ducklings until they are grown to near adult size, the “teen age” stage. 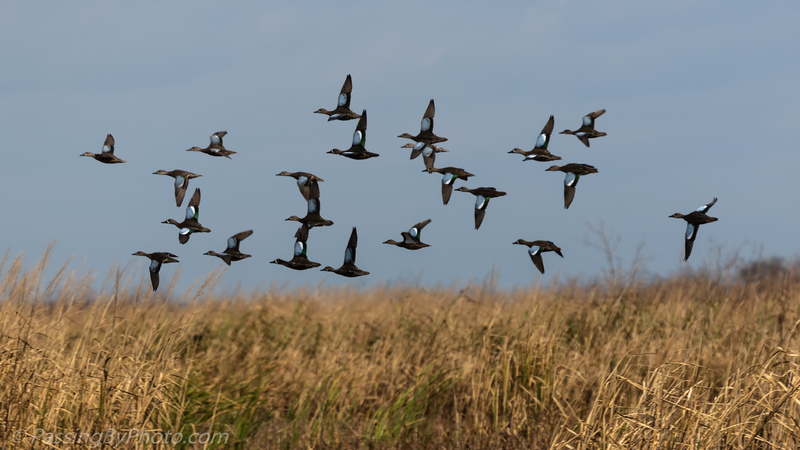 The males are sometimes around but don’t seem to supervise the young the way I’ve seen the females herd their charges around. 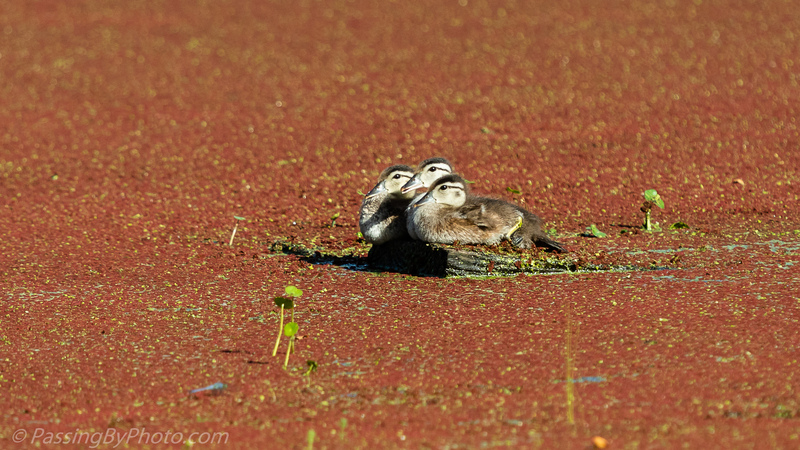 No adult was in sight for these three ducklings and I suspect the mother became lunch for a predator. 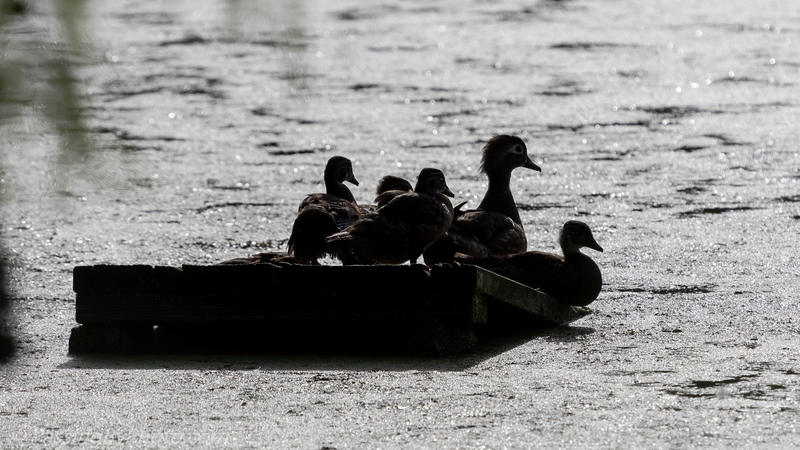 The survival rate for the ducklings is low and the adults can fall victim to alligators, hawks, or eagles. 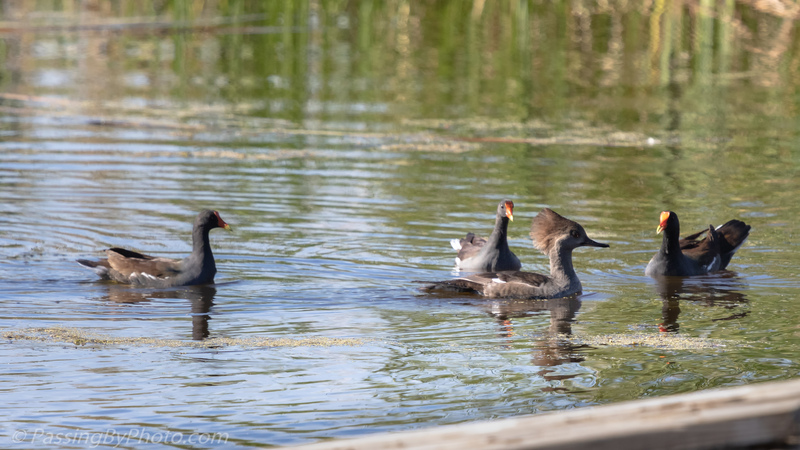 These three were sticking together, swimming around the pond to various perches. 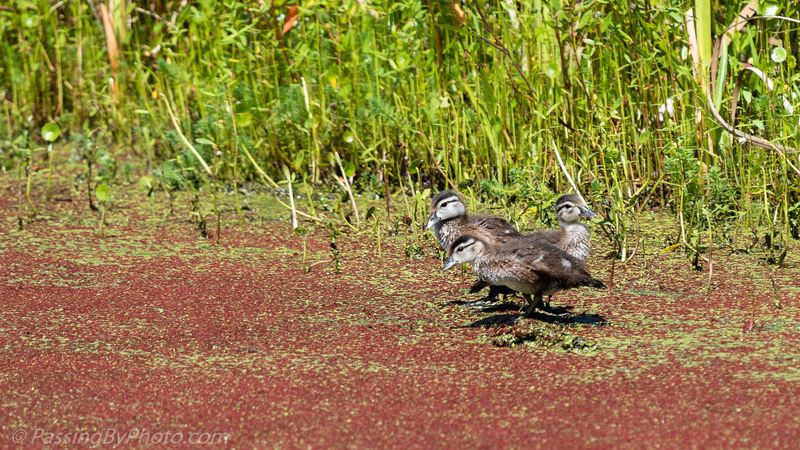 As plant eaters these ducklings don’t rely on the parent bringing food, they just eat what is around them. 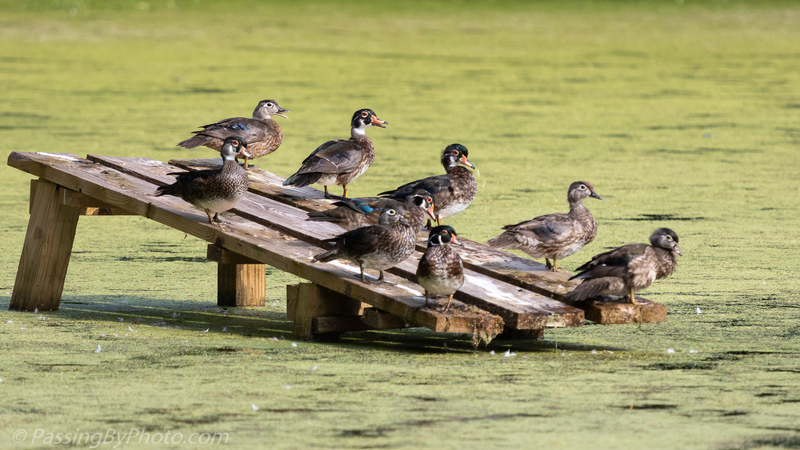 This board they are settled on is an Alligator ramp that has been slowly sinking into the pond over the last year. 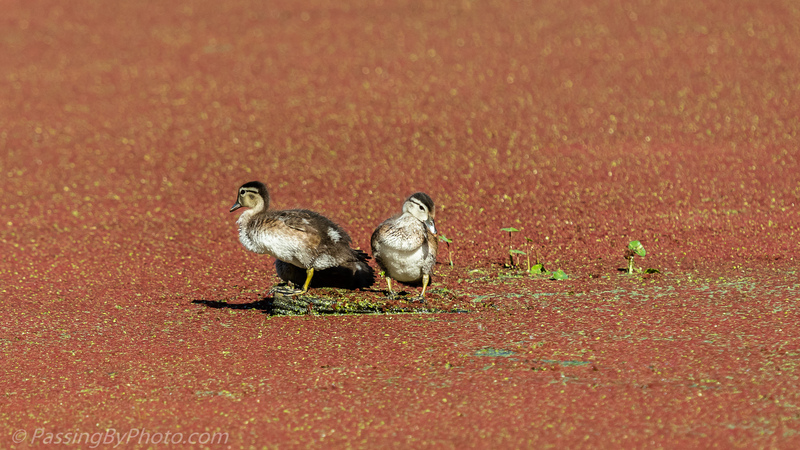 The surface of the pond is covered with a mixture of green Duck Weed and some variation of Mosquito Fern, the red plant. 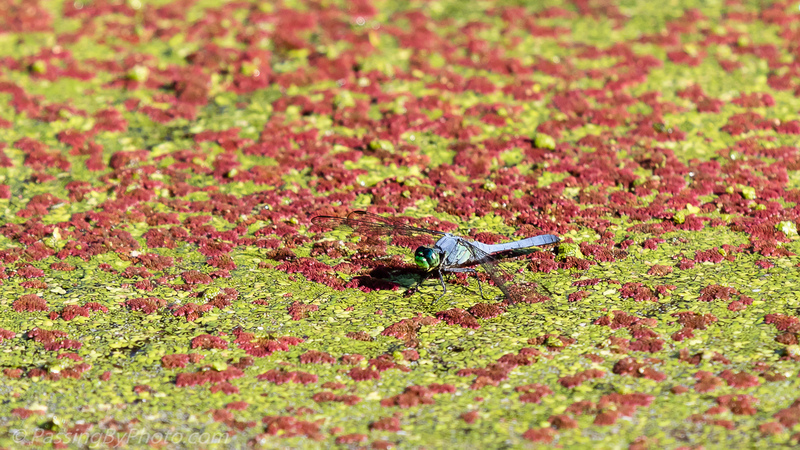 Zoom in on the closer image of the dragonfly perched on the surface to see the plants in more detail. 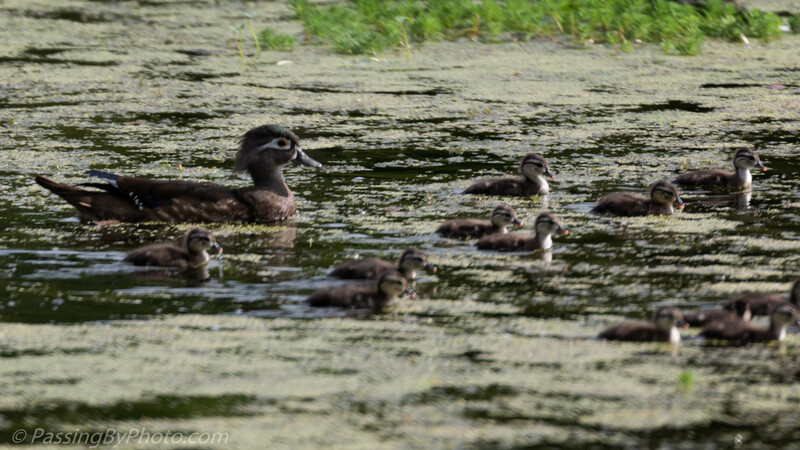 The oldest Wood Duck chicks on the pond right now are almost indistinguishable from their mothers. 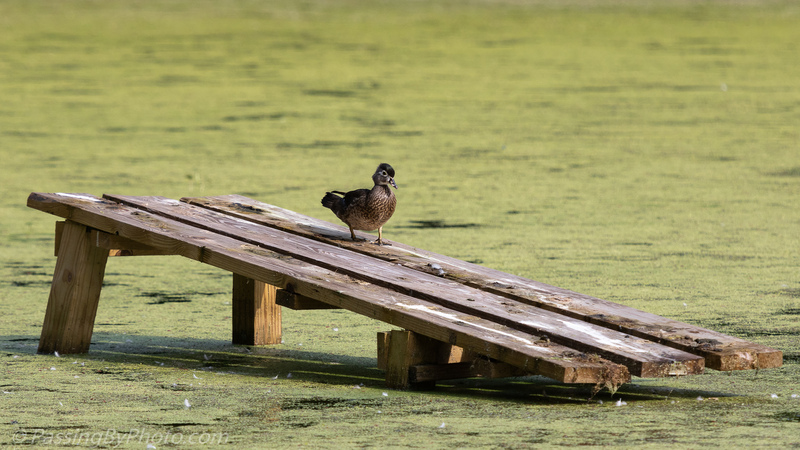 This old alligator platform gets smaller every week, either sinking or rotting into the pond. 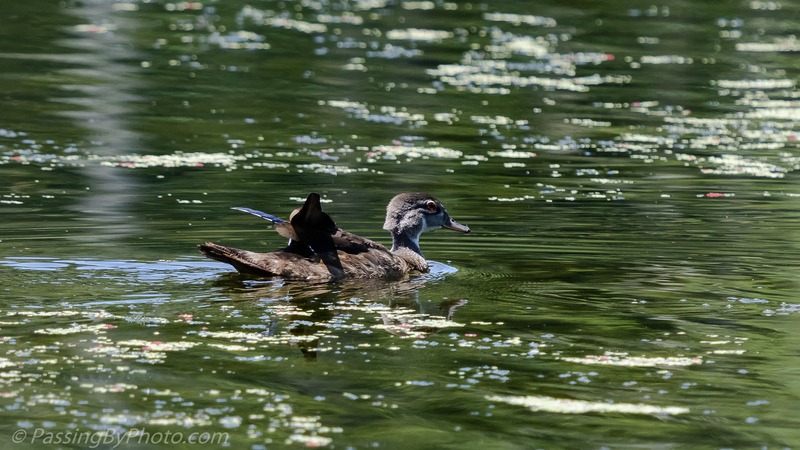 This small family squeezes together on it to groom and soak up the afternoon sun. 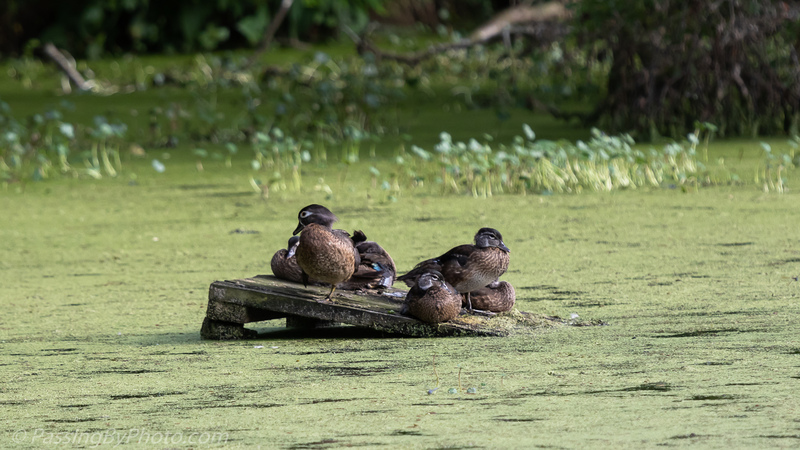 From the end of the pond you get a view of the platform with the sun glaring off the duckweed. 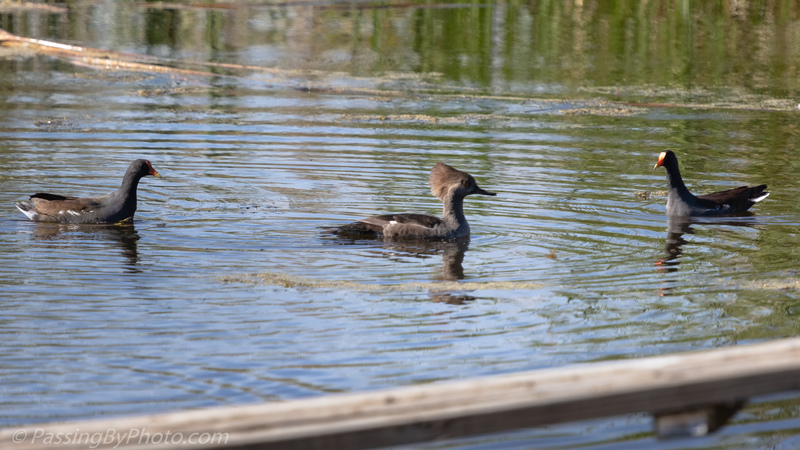 In silhouette you can see mother duck standing a little taller and with more head feathers than her four youngsters. 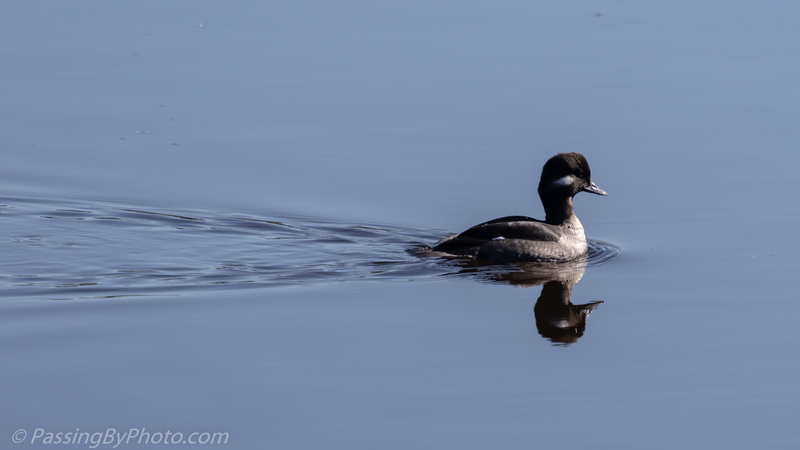 She had turned just a bit to see which way I was headed. 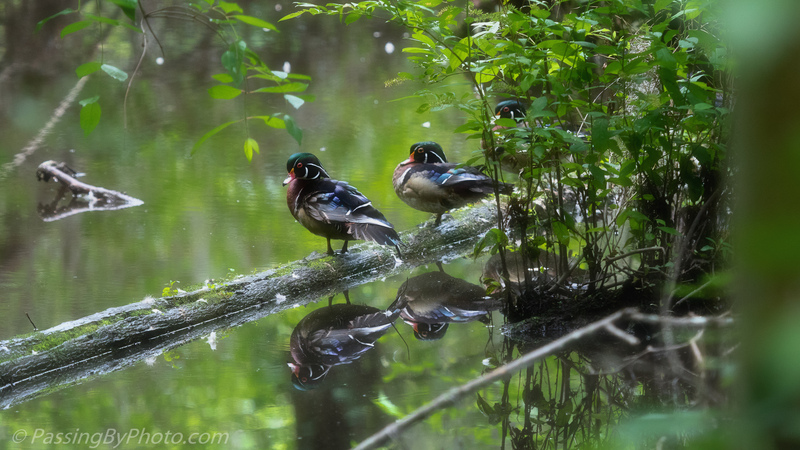 Perched on a log a group of male Wood Ducks were just hanging around, doing some stretching. 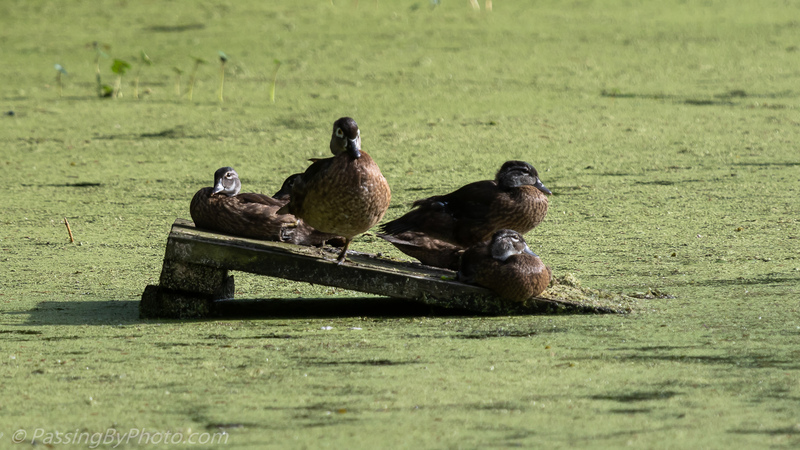 At least three were lined up on this log and a few more were in the water behind this clump of trees. 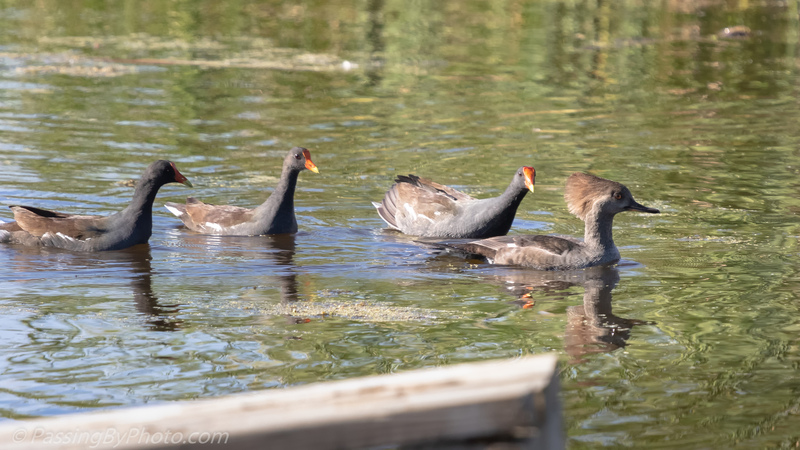 Time for a swim, one by one they took to the water. 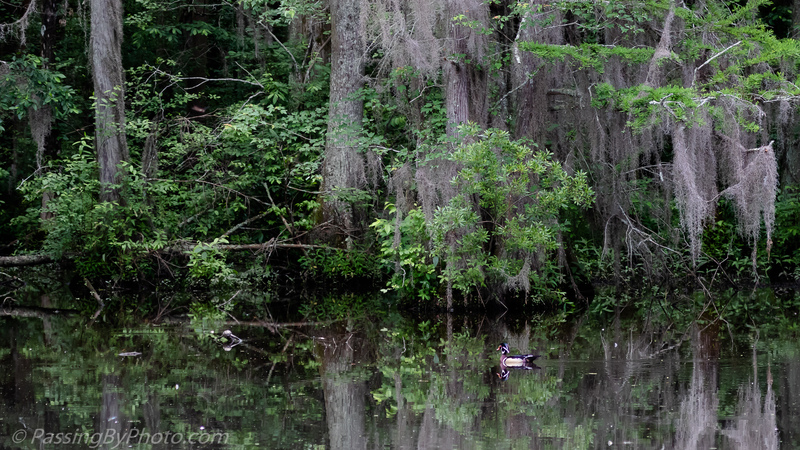 There is an open pond at the edge of the cypress swamp and this fellow was going off on his own.